Have you been yet? Oh my gosh...if you are in anyway curious about fashion, or appreciate the art of fashion you absolutely have to go see this exhibit. I went a few weeks ago with Lee Ann at the Carnegie Museum of Art and I'm absolutely going again. Listen...I have a passion for fashion, as does Lee Ann. It's such an exhilarating part of my work and it is such a lovely additional creative outlet that goes hand-in-hand with my style of photography. 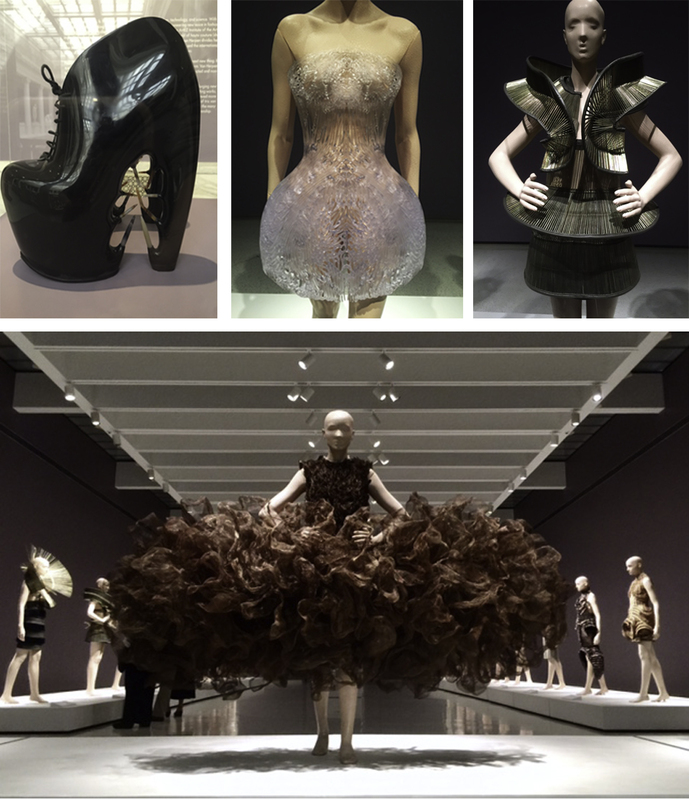 But I have to say, this work from Iris Van Herpen is way beyond fashion. Simply said, it's art. And I know: every designer's work is their art...but that's not what I mean. Herpen's artistic expression through the materials she uses, in combination with the initial inspiration for each line, is truly some-kind-of-magnificent. If I could spend just 5 minutes inside her head I would either explode from an overdose of creativity or walk away inspired for life. Reading some of the placards that explain her motivation behind her works is otherworldly. As I walked through the exhibit and took everything in, I couldn't help but keep going back to how much it seemed some of Herpen's pieces were inspired by the works of Alexander Mcqueen (look at the black shoe that inspires images of McQueen's Plato's Atlantis show, and make sure to take in the orange number and the clear dress, both printed on a 3d printer). Then I read on one of the placards that she interned at with McQueen in 2010 and it all made sense to me, and it was actually a really exciting moment for me because Alexander McQueen is one of my all-time favorite designers. However, Herpen's unique use of technology in her pieces absolutely sets her apart from all of my favorite designers. For instance, take a look the photo in the upper right hand corner above. That piece was created on a 3d printer, as was quite a few of her pieces, as mentioned above. I wish you could see it up close...the intricacy was maddening. And just look at the dress that has the plastic attachment below. I thought that piece was interesting, at the very least, but when I read the placard explaining that it was Herpen's curiosity with the visualization of a large splash of water, and what that would like in terms of fashion, I was in awe. I had to take a photo of the professional photograph taken on a black background. You really get the true sense of it there. Can you imagine your brain working like that?? The one that looks like an asian warrior piece (the brass one) is actually made from the metal pieces/connections from children's umbrellas. What?? What I loved most about Herpen's work was her intimacy with what inspired each and every piece. The details, the hands-on manipulation of every material she used, the mind-blowing ideas behind the lines...it was really something I didn't quite expect at all and am so thrilled that I took the time to go and see her work. And you should too. And though this will seem a bit random to accompany this post, I'd like to give a shout out to Ashley Cecil and a pat on the back for us. Ashley is a brilliant artist working in residency at the CMOA and she's working on some pretty amazing and important projects over there. Make sure to check her out. 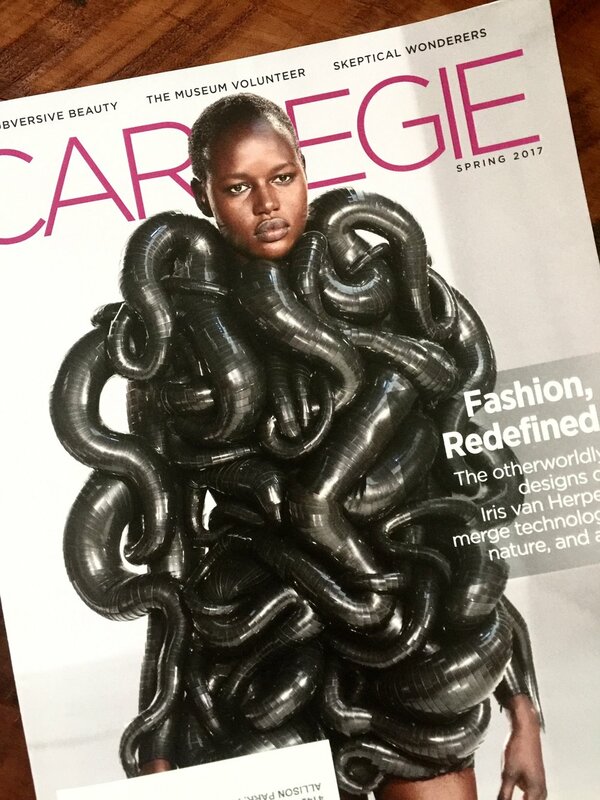 You can see her lovely face in the photo below, which I took (there's my pat on the back for having a photo featured in the CMOA Magazine...the same magazine that Iris Van Herpen's work is allllll over. Yeah...Iris and I are like besties now. Bonded for life). So don't miss your chance to go and experience some incredible fashion accompanied with some pretty incredible behind-the-scenes information. And while you're there, take a moment to check out Ashley's work as well. You won't be disappointed with either! !